The reflections, stories, and tips of a broke college kid. Since high school I've been developing a portfolio featuring hijabi women, and to this day I'm still on that creative journey. Sometimes I wonder if I create too many artworks of the same subject. It wasn't until this past year that I've realized that I may be portraying hijabi women over and over again, but there is much to say about them. My experiences are constantly changing, and so is my identity. In one of my communication courses about performance, we did an installation under the theme of "Art Imitating Life". I looked to my own artworks and realized that I could do a similar installation but reverse the theme into "Life Imitating Art". I wanted to create a series of portraits featuring my old paintings, but recreated on models through face-paint (thus literally bringing my paintings to life). And so, I hit up my talented photographer friend, Vi Hunyh, and we began our first collaborated project. We met up in the late afternoon and spent about an hour or two painting the 3 models who volunteered their faces as canvases. It was an interesting experience for me, for I felt an odd sense of familiarity as I reacquainted myself with paintings I created years ago, but on different faces. And little did I know that this sense of familiarity would later reveal something quite different and striking at the same time. After the photographs were edited and processed, I divided them into 3 stages of Identity development. 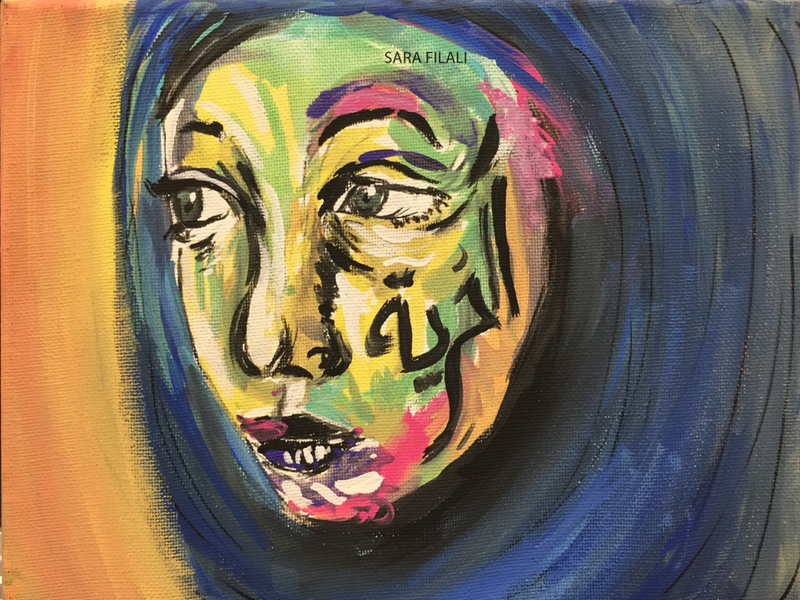 The Identity series is an exploration of the essence of being a Muslim American woman. "The heavy gazes of others leaves me half-exposed, despite my attempts to stay covered. This is the juxtaposition of my existence." This stage was inspired by a painting called "Imposed Identity", which explores the internal conflict of Muslims caused by the 9/11 incident in 2001. An onslaught of negative depictions in media and a rise of islamophobic actions against Muslims ensued, and remains ongoing to this day. This causes a sort of split internally. On one hand, we are American, and most of us were either born here or our parents came to this country searching for promised freedom and opportunity. We find refuge in the ability to freely practice Islam without legal discrimination. On another, we are outsiders. The very nature of our ideology is encapsulated by the "East vs. West" conflict, and thus our identities are questioned. To embrace one fully means to lose hold of the other, leaving us in a state of vulnerability. This is what is at stake for us. And to hold your stares with my own. for my essence is not black and white. and will forever remain one. To answer the One who summons me. "And without question, we, too, belong. When we realize that there is no one greater than us but God, we achieve true freedom." This stage explores the beauty of embracing one's intersectional identity and its complexities, and the balance we achieve when we realize our identities are unique. There may be struggles, but that is okay. We embrace it. And for the women who remind me of Him. Special thank you to Vi for her talent. You can find her work here. Another huge thanks to Heebah Ahmed, Hajar Chehtane, and Zaineb Zinoune for modeling.